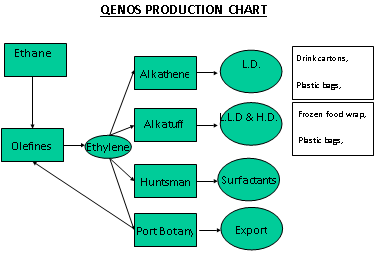 Qenos is the only manufacturer of polythene in Australia and employs 800 people on two sites in Botany, NSW and Altona, Vic. Site Utilities – which operates three boilers and supplies steam, cooling water, townswater, firewater, compressed air, electricity and drainage services to all BIP plants. Qenos has an excellent record in safety, health and environmental management, with no serious incidents being recorded for several years. Nonetheless, Qenos continues to take the protection of the workforce, the community and the environment very seriously and is committed to the maintenance of its world-class safety, health and environment operating system. At the heart of this commitment is a team of experts to support Qenos’ manufacturing facilities in Botany and Altona in Victoria. This team works with the operations teams to help them manage all aspects of process and personnel safety, occupational hygiene and environment protection. Qenos recognises that maintaining its excellent performance in health, safety and the environment lies with those men and women running the plants day-to-day. Qenos is committed to training these employees to the highest level and ensuring that they understand their responsibilities. Qenos encourages its employees to make a positive contribution and to help shape Company direction. Qenos and its employees share a vision and both are totally committed to protecting the workforce, the community and the environment. 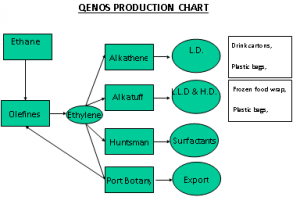 Qenos devotes significant resources directly to programs designed to ensure the long-term safe operation of the facilities, as well as to programs that can enhance the safe and environmentally sustainable production of polyethylene. Qenos is compliant with all the requirements of the NSW MHF legislation. Two of Qenos’ plants which use large amounts of flammable gases are equipped with flare systems to manage the safe disposal of excess gases. These flare systems are located at the northern end of the BIP, near the intersection of Baker and Anderson Streets, Banksmeadow. When the plants are operating normally, small amounts of off-gases are burnt in ground furnaces, which have no externally visible flames and which do not emit externally noticeable noise. However, when the demand is higher, such as during the operations to shut down the plants, the ground furnaces are supplemented by high capacity elevated flares. The Olefines Plant flare is a tubular structure about 70 metres tall. On the infrequent occasions when we use this elevated flare, there is a large, visible flame and accompanying noise. When a planned shutdown occurs, this flare is operated at the lowest rate we can manage, for as short a time as possible, in daylight, to minimise any concern in the community. However, should the plant experience a malfunction which automatically shuts it down for safety reasons, we cannot select the time, duration or intensity of its operation. At such times, it may be very noticeable. The smaller Alkatuff flare looks like a vertical grey cylinder, about 20 metres tall, with burners surrounding the top edge. When it activates, all the burners light up. Again, there is a visible flame and accompanying noise. 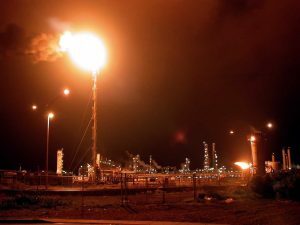 Just like the Olefines flare, operations due to an automated safety shutdown of the plant are not planned and may therefore occur at any time. Most of our flare systems rely upon the injection of steam to the flames to obtain complete combustion and ensure a clean flame. Under certain circumstances, smoke may be seen coming from the flares. This smoke from the flares (along with the other combustion products) does not pose a health risk to the community. It should be remembered that these flares are safety devices, installed for the protection of the community and the plants. Should you witness their operation, be confident that they represent an assurance of your safety, not a risk to you or your families. However, if you still have any questions, please call the community hotline. Qenos as part of ChemChina’s Bluestar Group, continues to support the development of a new health, safety and environment culture with on-going cooperation between Bluestar Plants in China and Qenos’s facilities in NSW and Victoria. Qenos is also committed to environmental sustainability and the third edition of its Sustainability report was published in 2015. Orica Limited is a listed ASX Top 50 mining services company with global operations. Orica has a diverse workforce of over 12,000 people servicing customers across more than 100 countries. Orica is the largest provider of commercial explosives and blasting systems to the mining and infrastructure markets, a global leader in the provision of ground support in mining and tunnelling, and a leading supplier of sodium cyanide for gold extraction. In the past Orica also manufactured a wide range of plastics and industrial chemicals, some of which are still manufactured by others at Botany Industrial Park (BIP). For more than 70 years Orica and its predecessor, ICI, had manufacturing operations at BIP. During former operations environmental standards and regulations were not of today’s standards and contamination of soil and groundwater occurred. Orica is undertaking remediation projects at BIP, including treatment of groundwater at the Groundwater Treatment Plant, and is committed to safely cleaning up its legacy contamination in consultation with government and the community. Orica no longer has any chemical manufacturing activities at the BIP and over recent years Orica has sold lands that have been remediated. Originally known for pioneering innovations in packaging and, later, for rapid and integrated growth in petrochemicals, Huntsman today has approximately 15,000 employees and operates from multiple locations worldwide. At Botany, its Surfactants Plant manufactures a range of over 300 products for many essential industries including detergents, personal care, agriculture, automotive, mining, textiles and chemicals. Some common product groups include cleaning products, brake fluids and radiator coolants. Huntsman is committed to a sustainable future with the aim of zero harm to people, assets, communities and the environment . The Ixom Botany ChlorAlkali facility is an integrated complex of plants producing chlorine-based products from electrolysis of natural sea salt. Our four main products are sodium hypochlorite, hydrochloric acid, caustic soda and ferric chloride. The Ixom Botany ChlorAlkali facility manufactures chlorine and caustic soda from the electrolysis of salt. Hydrogen is produced as a by-product. The plant is based on modern mercury-free membrane technology with capacity of 90 tonnes per day of chlorine. The chlorine produced on site is used in the manufacture of hydrochloric acid, sodium hypochlorite and ferric chloride, with these downstream processes being collectively referred to as product plants. All chlorine produced at Ixom Botany ChlorAlkali facility is consumed in the product plants. The facility stores a certain number of chlorine drums and cylinders filled in Laverton, Victoria (Australia), for a distribution purposes. The following diagram provides an overview of the Botany ChlorAlkali facility and products plants process flows. Ferrous chloride (also known as pickle liquor), recycled from steel pickling bi-products, is stored on site for use by Sydney Water in waste water treatment and handling. We deliver a broad range of services that are essential to clients across multiple sectors. Our approach integrates a focus on optimising performance, integrity and output of our clients’ businesses and assets to deliver real business outcomes safely and responsibly, with a diverse, collaborative and caring workforce. We deliver safe, efficient and sustainable services, supported by robust systems and processes and a commitment to proactively managing our environmental, social and governance responsibilities. To this end, good corporate citizenship is an essential part of our business strategy and narrative. We operate in the Defence, Property, Social, Infrastructure, Resources and Industrial sectors, and provide Logistics, Facilities Management, Consulting, Construction, Care, Welfare, Operations, Maintenance, Well Servicing, and Business Support services. With more than 60 years of experience providing integrated solutions we are able to bring a new perspective to clients in the delivery of asset management solutions. We employ more than 25,000 people across 18 industries and 9 countries with an annual revenue of AUD 3.8 billion.